The other night I didn't feel like making a big, heavy dinner so I ended up making something deliciously amazing: a smoothie bowl. Then I remembered smoothie bowls have been a trendy thing since like 2013. And it was actually kind of an accident so really I can't give myself any credit for this recipe idea. But I still love me. It's cool. I didn't have any fresh fruit so I threw a bunch of frozen stuff (strawberries, pineapple, etc) in the blender along with some coconut meat. It was so thick I decided to pour it into a bowl and eat it with a spoon (I had just enjoyed some medicinal herb so my brain was thinking a bit differently, if I had been my normal self I would have just added more liquid and a couple dates and drank it normally... I love plants and what they do for us). Then I got the brilliant idea to pour maple syrup all over this concoction because it's a well known fact that maple syrup makes everything better. Well, I freaked out. I just stood at the counter, alone in my dark kitchen, moaning with pleasure and vacuuming the super sweet smoothie into my mouth until I got a brain freeze. IT WAS SO GOOD. 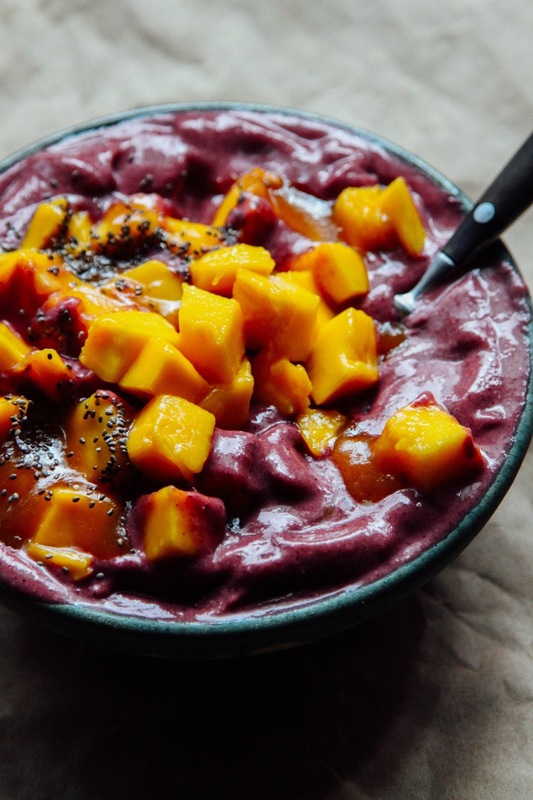 I've been making these smoothie bowls pretty regularly ever since. Obviously I want to share a recipe for my new fave thing with you but to be honest the smoothie I just described above was quite ugly to look at; a pinkish sludge covered in syrup. THEREFORE this recipe is a bit fancier and sexier than the ones I have been making that go un-photographed, because no one wants to look at a gross smoothie. There are way too many gross smoothie pictures on the internet already and they need to stop. The recipe is simple enough (as usual): basically just a bunch of frozen fruit blended together with coconut meat. Then instead of plain maple syrup I made a baobab caramel type thing; it's actually kinda freaky how it resembles caramel once you stir together the ingredients. 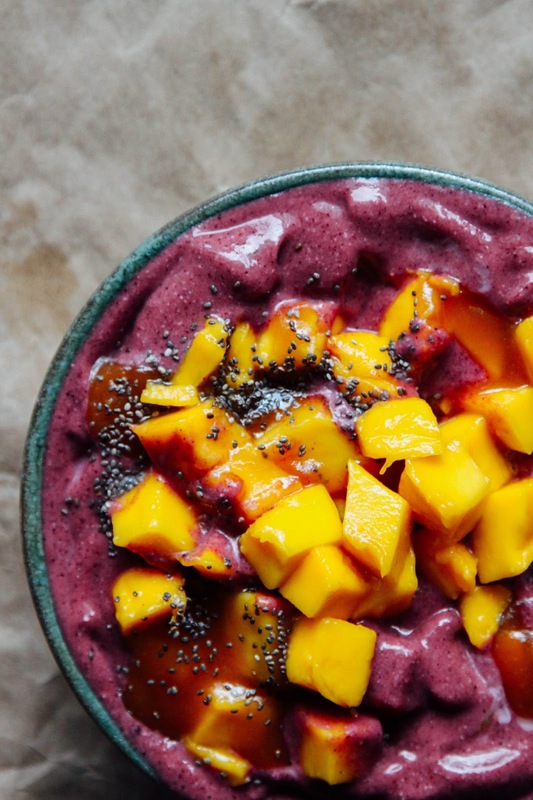 Finally we top it all off with fresh mango and chia seeds because why not. I hope you thoroughly enjoy it. Definitely recommend pouring extra maple syrup on it. 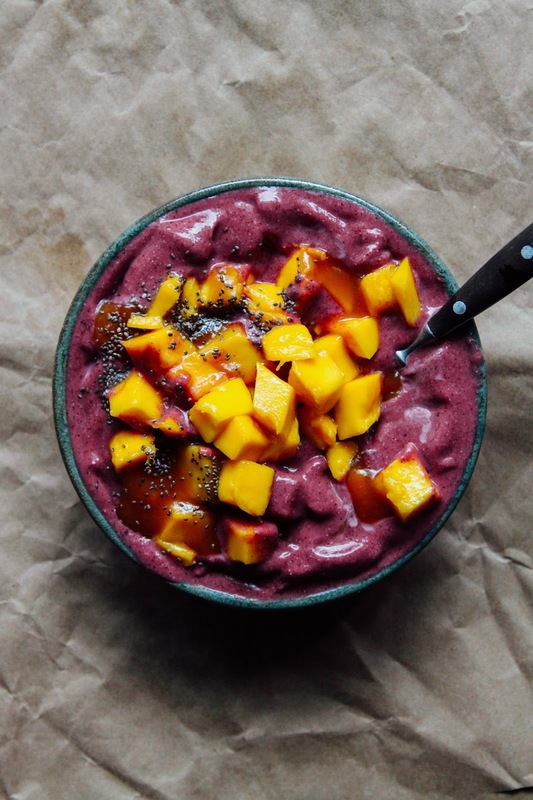 To make the smoothie: blend together the smoothie ingredients until smooth and thick like melty soft serve, add coconut milk or other liquid as you go. Scoop into a bowl. To make the caramel: stir together the ingredients until it looks like caramel, it only takes a few seconds. Magic. Scoop the fresh mango, caramel and chia seeds onto your smoothie and dig in with a spoon.